Basic redirection: All respondents will be redirected after completing the quiz. If you have a Results or Thankyou page configured then they will be displayed prior to redirecting the respondent. If the Quiz option is selected then the respondent will only be redirected if the quiz status is set to Open. If the respondent has self registered then any registration details will also be automatically passed to the new test. 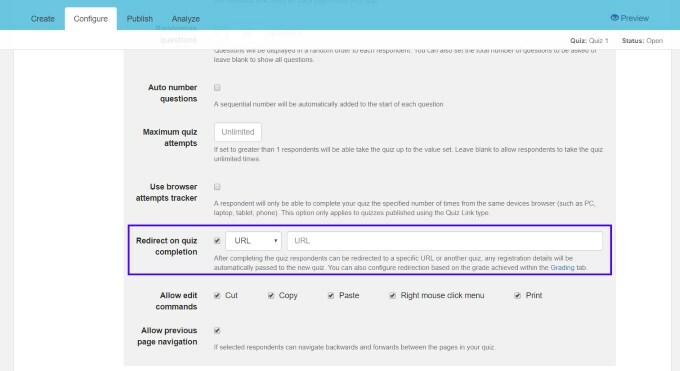 For each grade you can set if the respondent will be redirected to another URL or Quiz. If the location field is left blank then they will not be redirected. Similar to the Basic Redirection the respondent will only be redirected if the quiz is Open and also any registration details will be automatically passed to the next test.